Mary Ellen Parker of Bee Tree by m.e. "I love the airy, romantic feel of this piece! All the elements work well together to convey that theme. 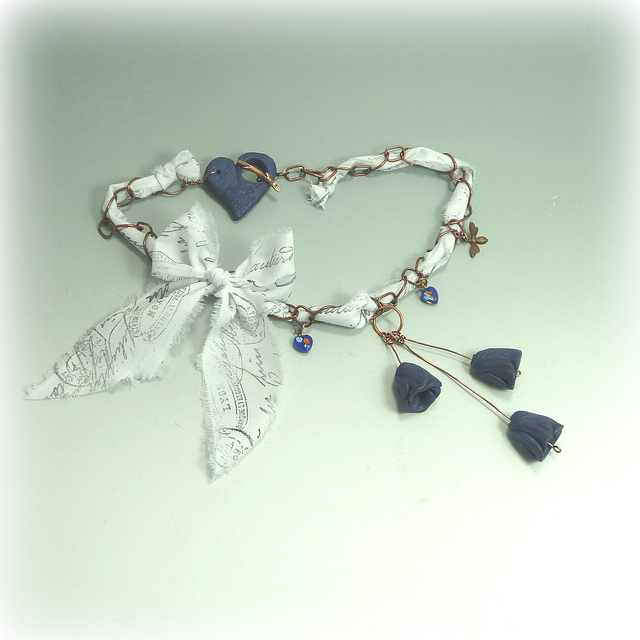 The French script fabric ribbon and polymer clay blue flowers and heart clasp tie in nicely to the French inspiration painting." You can read about Mary's necklace and her thoughts and inspiration behind her creation on her blog. You can also find Mary's handmade polymer clay beads, pendants and toggles in her Etsy Shop. Her work is really lovely! Congratulations on being the featured artist this week, Mary Ellen! Awesome design this month, my friend. You know I love your flower beads, and I enjoyed your blog post about creating this piece, too. Lovely piece! I have enjoyed seeing Bee Tree designs before and this one is simply elegant. Thank you all very,very much ! I love this month's inspiration painting. Can't wait to see more entries!!! Absolutely beautiful! It's amazing how the same painting can inspire such different pieces. Yes, very romantic. Congratulations Mary.